We will take care of all your grease trap needs in a professional and timely manner leaving you to tend to your everyday restaurant and kitchen needs. Restaurants that create high volumes of oil should pump their grease trap every month to ensure the reserve basis within the restaurant flooring is not compromised which could cost you thousands of dollars in revenue loss and not to mention heavy fines from the utility department if your traps are not maintained. All County Septic and Plumbing will pump, install, or repair your grease trap. 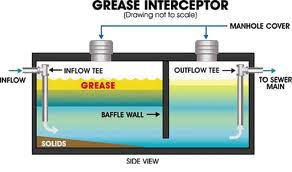 If you produce a high volume of grease, get your grease trap pumped once a month. Normally, these small amounts of oily scum layers will enter into the septic tank or facility and are very slowly digested and broken down by microorganisms. However, very large amounts of oil from food made in restaurants and production kitchens can destroy septic tanks or the treatment facility and cause blockages in drain pipes. This devastating end result can reap havoc upon the environment if not properly contained. With regular maintenance and our grease fighting products, worrying about your grease trap will be a thing of the past. If you are a kitchen or restaurant owner you know how important it is too ensure that your grease trap is maintained regularly. Save money with our service agreements. Our service agreements will save you money, time and the headache of remembering to routinely call for your grease trap service. At All County Septic and Plumbing we take care of all your grease trap needs, keeping you free of costly backups and embarrassing smells associated with drain lines. We offer monthly, quarterly and annual agreements to fit everyone's needs. Please call for your FREE ESTIMATE.